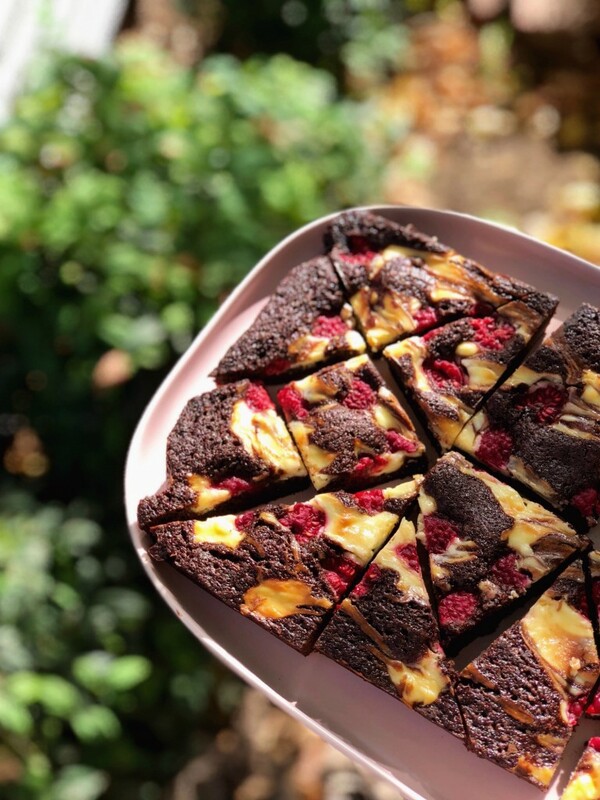 Swirls of cheesecake, a punnet of raspberries, and a delicious brownie treat. I have to say this was not what I had planned on baking with these raspberries. I had planned out a decadent cake recipe, with a tangy rich icing that probably will taste incredible when I finally get to bake it. But we decided to do a tonne of work in the yard, and the day got ahead of me yesterday, so I had to think of something a little easier to whip up. I don’t know if it happens to everyone else, but I often end up using the ingredients I buy to make something else entirely. With my oldest home on a pupil free day, I also wanted to make something together. The easiest way for me to bake with my girls is to work on recipes that have different parts. That way while someone is doing one part, the other person can be working on another. I have a tendency to take over as a teacher, but I’m getting better. I think.. So I went back to an old recipe of mine. The brownie recipe base is one I found by Emeril Lagasse. 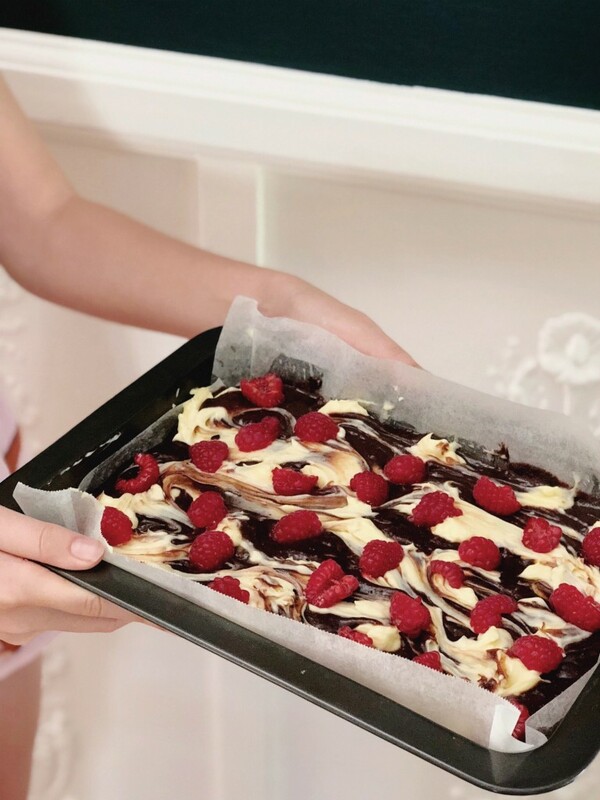 I love to top it with a little cheesecake style swirl, and it struck me that chocolate and cheesecake would be a perfect way to use up those berries. Especially since we have family coming tomorrow, and these freeze really well. I always chill them in the fridge for a couple of hours, covered, before cutting, and then you can either eat them right away or freeze them for a good couple of months. That way they’ll be perfect to whip out the next time you are craving something rich and chocolatey. Place shortening in a microwave safe cup and melt. In a large bowl, mix the cooled shortening and sugar with a whisk. Add the eggs, one at a time, whisking well after each addition. Add the water and vanilla. In a medium bowl, sift the flour, cocoa, baking powder and salt. Whisk flour mixture into wet ingredients until just combined. Do not over beat. In a separate bowl, whisk together all the ingredients for the cheesecake filling. Pour the brownie batter into the two pans. Place dollops of cheesecake topping all over. 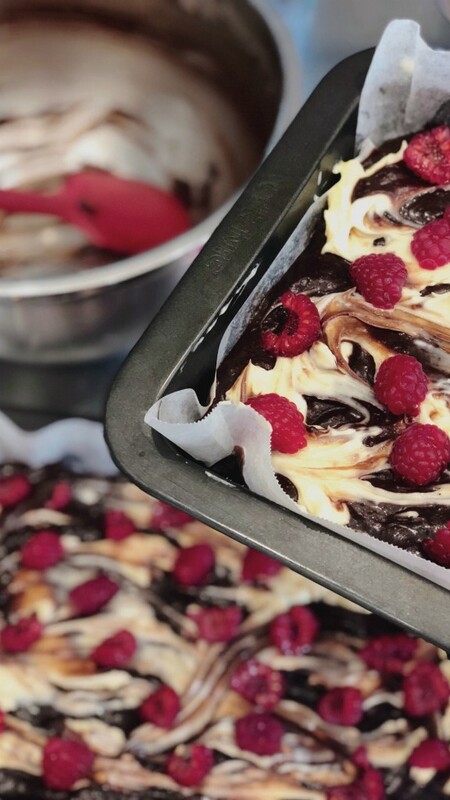 Use a fork to swirl, before topping with raspberries. Bake for 26 - 28 mins, or until the top springs back slightly when touched. Allow to cool in it's pan for 10 minutes. Remove from the pan and cool completely on a wire rack.